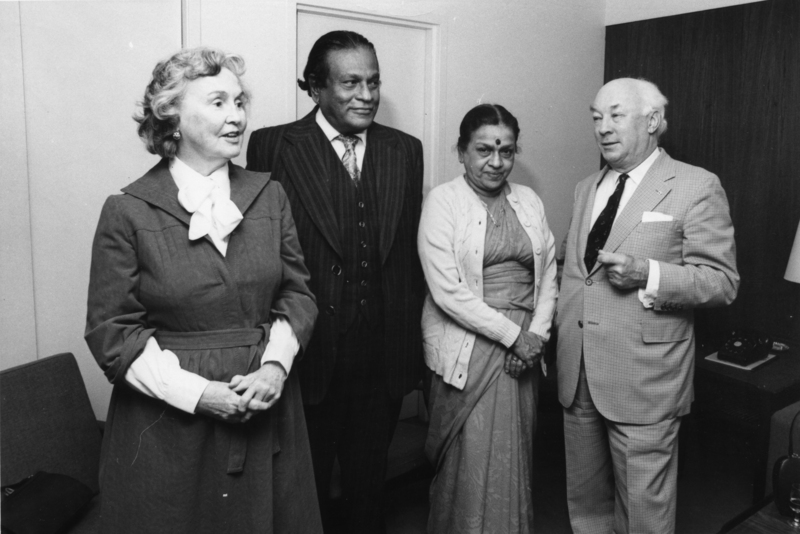 Item is a photograph of Dr. Henry Hicks and Mrs. Hicks with the Sri Lanka High Commissioner to Canada, Dr. Henry W. Tanbiah, and his wife. Photograph shows (from left to right) Mrs. Hicks; Dr. Tanbiah; Mrs. Tanbiah; Dr. Hicks. Photograph was published in University News, Vol. 7 No. 4, October 28, 1976. Item is accompanied by a newspaper clipping with a caption that reads: "Dr. and Mrs. Hicks were hosts at a luncheon last week for the Sri Lanka High Commissioner to Canada, Dr. Henry W. Tanbiah. Left to right, Mrs. Hicks; Dr. Tanbiah; Mrs. Tanbiah; Dr. Hicks."